Healthizen's Blog: Go Green to Glow from inside! Go Green to Glow from inside! Even after knowing all the good things about green leafy vegetables - they usually top the list of "Don't Want to Eat" or "Cant Eat" vegetables! Most of the green portions of the vegetables go down the drain as a waste product, whereas they prove to be the most effective portion of the vegetable from the nutrition point of view e.g. : cauliflower greens, turnip greens, beetroot greens and the portion other than the leaves especially of coriander! "Why should you include more greens in your diet! " 1) Very Low calories - All greens contain high water content and very low density of calories, which make them a super diet food! 2) Rich in vitamin A (carotenoids) - Needed for better immunity, vision and glowing skin. 3) Good source of vitamin C - Good for healing, good for skin and good for absorption of iron form the food. 5) Good source of folate/folic acid - Needed for better digestion and essential for the development of red blood corpuscules. Phosphorus -builds and maintains teeth and bones, needed for muscles and nerves. Potassium -maintains normal blood pressure, heart beat and nerve impulses. Zinc -Needed for growth, immunity, digestion, skin, improves sense of taste and wound healing. Manganese -collagen production and healthy skin. 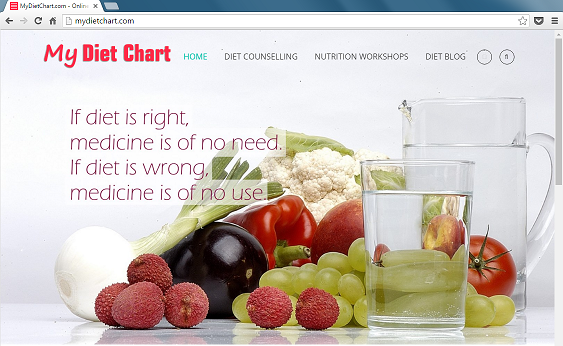 Pantothenic acid -needed for synthesis of carbohydrates and cholesterol. Biotin - important for energy, skin, hair, fat and protein breakdown. Copper -needed for proper growth and development, maintenance of bones and connective tissues, and gets rid off the free radicals! Iodine- growth of nervous system and builds energy. 7) Lutein and zeaxanthin - play a protective role in the eye, protecing both the cataract and the age related degenration. 8) Quercetin - Has an anti-oxidant, anti-inflammatory activity and also posseses anti-cancer properties. 1) Raw greens have smaller shelf life. 2) Need a lot of sorting, selecting, grading, cutting and washing as compared to other vegetables, which results in longer pre-preparation time. 4) And last but not the least - A bowl full of cut green leafy vegetable on cooking would reduce to 1/4th of the original quantity, hence lower cooked portion. 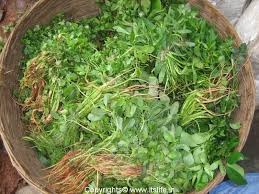 Some green leafy vegetables that can be used in daily meals are- spinach, fenugreek leaves, radish greens, mustard leaves(sarson), spring onions(hari pyaaz), colocasia leaves(Arbi ke patte), Green garlic, Beetroot greens, Turnip greens, Cauliflower greens, Wild spinach (bathua), Drumstick leaves/flowers, Banana flowers, Lal bhaji, Soya bhaji (suva bhaji), amaranth leaves (chaulai bhaji), malabar spinach (poi bhaji), Garden night shade (makoi ki bhaji) and many more.